I continually receive questions and comments about Fuel Filter Placement. 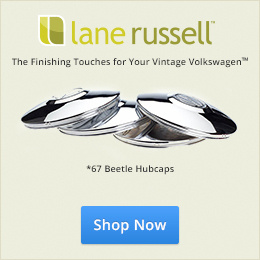 You will find a couple of Articles on 1967beetle.com regarding the subject. The common warning is: Fuel Filter in the Engine Compartment? You are heading for a Fire! So Beetle Owners hasten to place their Fuel Filters under the car near the back wheel or just under the Gas Tank. And…we believe that we now are safe from an Engine Fire. Period! This misconception is bound, sooner or later, to wreck havoc. Because we Beetle Owners become complacent. Installation of the incorrect Fuel Hose. The stock metal fittings in our Beetles take a 5mm Inner Diameter Fuel Hose. American fuel hose has a larger than 5mm Inner Diameter. Thus, when a clamp is installed, the American hose can become “puckered”, giving rise to the possibility of leakage. Installation of correct Fuel Hose. The correct, stock Fuel Hose has an Inner Diameter of 5mm, which accommodates perfectly to the stock metal Fuel Lines of the Beetle. Fuel Hose should be clamped to the metal Fuel Lines, using care not to clamp so tightly that the Fuel Hose is distorted. The Clamp wants only to be firmly fixed so that the Fuel Hose cannot be pulled off the metal tubing and won’t leak. Regular Inspection of Fuel Hose. Here’s where most of us fall short. We do not regularly inspect the Fuel System of our cars. I hope that you are keeping a Written Maintenance Record of your car. This can be kept on a computer or in a notebook stored in the glove box. No matter the method—keep a meticulous Maintenance Record. And one of the most important items on your check list should be the Fuel System. Especially Fuel Hose in the Engine compartment and especially Fuel Hose from the Fuel Pump to the Carburetor. Know when Fuel Hose in the Engine compartment was installed. We forget these things. What may seem to be only a year, quickly turns into 3 years or 5 years. Fuel Hose weakens due to several factors: Age, Heat, Vibration, Chafing and Ethanol. Fuel Hose that has been in the Engine Compartment for more than a year probably should be removed and new hose installed. This is so easy that most of us can do it in a half hour’s time. Heat is the enemy of many automotive components—but especially of rubber. The Core of the Fuel Hose is rubber. Heat hardens rubber and causes eventual failure. Vibration contributes to the demise of hardened rubber. Often, Fuel Hose comes into contact with other parts in the Engine Compartment. Rubbing, or chaffing, can cause even good Fuel Hose to wear prematurely. Mitigate losses by routing Fuel Hose so that there is a minimum of chaffing. Now, we come to the Hidden Enemy—Ethanol in the Gasoline. Ethanol causes most rubber products in our Beetles’ Fuel Systems to deteriorate. Unfortunately, we cannot find truly Ethanol-resistant rubber products for most of our VW applications. It is up to us to monitor our Fuel Systems in order to avoid this Unseen Predator. 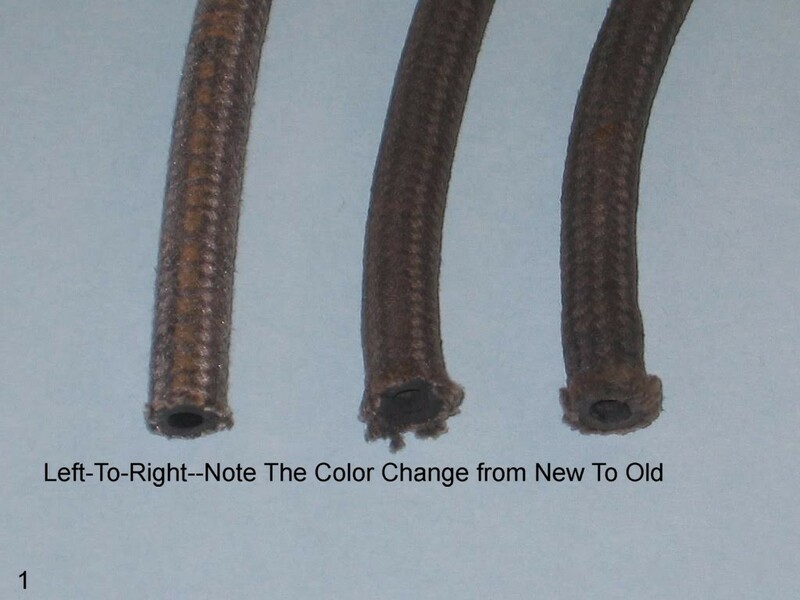 Frayed Cloth Covering of Fuel Hose is a sign of deterioration. Change the Hose. 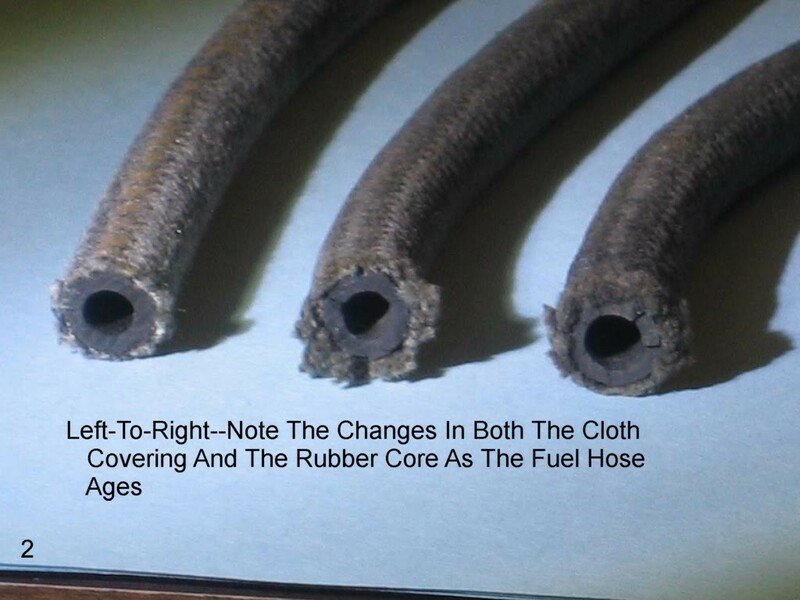 Cracking Rubber seen at the end of Fuel Hose is cause for concern and replacement is in order immediately. I have on my workbench specimens of Fuel Hose in varying states of deterioration. One specimen has good (in appearance) woven covering but when bent, a crackling can be felt. Meaning that the inner rubber core is old and brittle. A customer stopped at the house for a part. When questions arose about the part, I asked if he had driven his Bug to the house. He told me that he had parked it out front. We went to the car and opened the engine compartment in order to verify the part which he needed. I put a finger onto the Fuel Hose where it leaves the Fuel Pump for the Carburetor. Immediately, the Hose became wet with Fuel! I told the customer to drive his car into the driveway, where we changed his Fuel Hose. I think that we avoided a catastrophe! At some later date, I was inspecting my own ’67 Beetle and found a similar condition. You can bet that I went for the new Fuel Hose right away. I didn’t say…”I’ll change that one of these days.” I changed it then and there! What—Another Cause of Engine Fires? Now, I want to talk about a cause of Engine Fires that vies with flawed Fuel Hose for the Number One Cause of Engine Fires—it’s the Brass Inlet Tube of the Carburetor. This is the Tube where Gasoline enters the Carburetor. The Fuel Pump has pressurized the Fuel and sent it to the Carburetor Bowl. That means that there is at least 2.8 pounds per square inch of Fuel Pressure leaving the Fuel Pump. If you were to remove the Fuel Hose at the Carburetor, with the Engine running, there’d be an awful lot of Gasoline squirting onto the Engine—immediately! Here’s what happens. Over time, the pressed-in Brass Inlet Tube at the Carburetor can loosen due to vibration. And, due to pushing and pulling on the Tube when installing or removing Fuel Hose. And from cleaning the Carburetor from time to time. It is possible that having the Fuel Filter located between the Fuel Pump and the Carburetor can add a dimension to the situation by putting a bit of extra weight/stress on that short length of Fuel Hose. Over the years, I have made it my practice to “stake” around the Brass Inlet Tube by using a tiny center punch and a light-weight hammer. By placing the tiny center punch at several places at the base of the Tube (where it enters the Carburetor) and lightly taping with the hammer, a tiny indentation is created at each of those places. This expands the pot metal of the Carburetor, tightening it around the Brass Inlet Tube. This creates a more firm fit of the Tube. There is a better method, however. This involves removal of the top portion of the Carburetor and taking/sending it to a qualified shop for the following procedure. 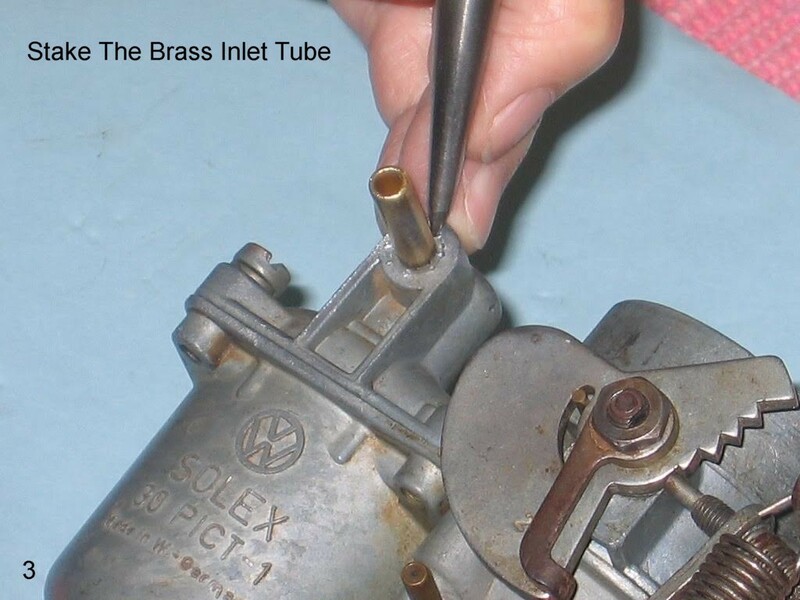 A technician will remove the original Carburetor Brass Inlet Tube. The orifice then will be drilled to a specific diameter. 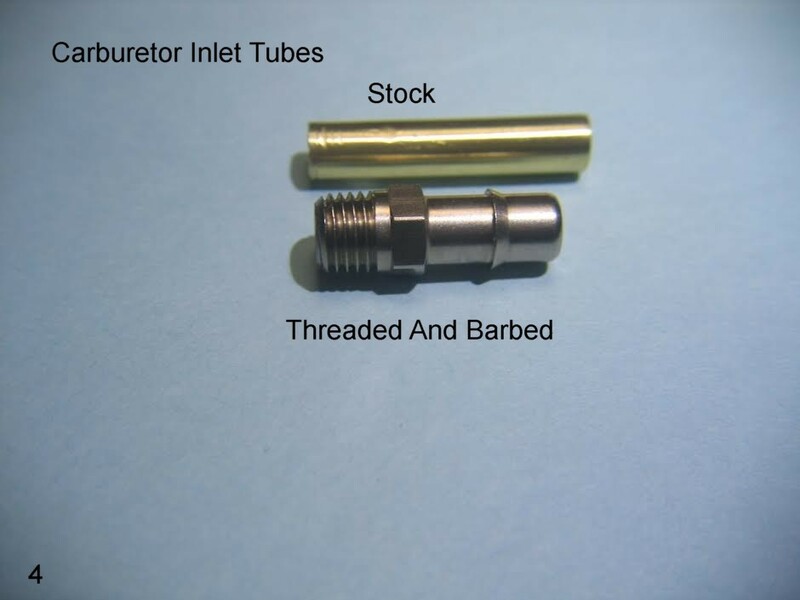 Once the orifice is the correct diameter, it will be tapped to produce threads to receive a Threaded Brass Inlet Tube. A shop in my area uses a special sealant on the threads to ensure a sealed fit with no leakage. The Tube part of this Threaded Fitting has what is known as a “Barb”. The Barb is a raised ring which grips the rubber core of the Fuel Hose when the Hose is pushed onto the Tube. Although the Tube has the Barb, I recommend a Clamp at this point as well. Once the Threaded Tube is properly installed, it never should loosen and fall out. Done! Occasionally, the High Pressure Tube on the Fuel Pump also will loosen and fall out. The same procedure that is described above can be used on Stock Fuel Pumps 1966 through 1970. Why does Fuel Hose for Air-cooled applications have a woven exterior layer? The answer is that the exterior layer helps to keep the Fuel Hose cool. It forms an insulating barrier against heat. I want to thank Doug Smith of R & D Engineering for his advice and the Barbed Inlet Tube prop for this Article. 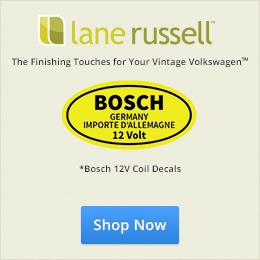 Doug has been very supportive of the Volkswagen Community locally and farther afield. His shop has installed a Barbed Fitting into the Carburetor of one of the Salser cars. I’m always grateful to my wife, Neva, for concentrating on photography for these Articles. Also, using a razor blade to GENTLY slice the old tubing lengthwise along the fitting will make it easy to remove and eliminate the tugging that tends to loosen the fittings. Good article, Jay. I agree, cutting the old hose helps w/ pressure. Over time, it is HARD to remove. Excellent article and all really good points. The dimpling idea works well and as a minimum, can help reduce fires. I’ve seen some people tightly secure safety wire from the fuel line clamp to a fuel pump/carb screw to reduce the chance of the fitting working it’s way out due to vibration. The best thing to do is actively inspect these areas every time you check your oil – which for me is prior to every time I drive my Bug. I too have found a slight dampness at the end of a fuel line and though the drive is delayed for a few minutes, a potentially devastating fire can be avoided. 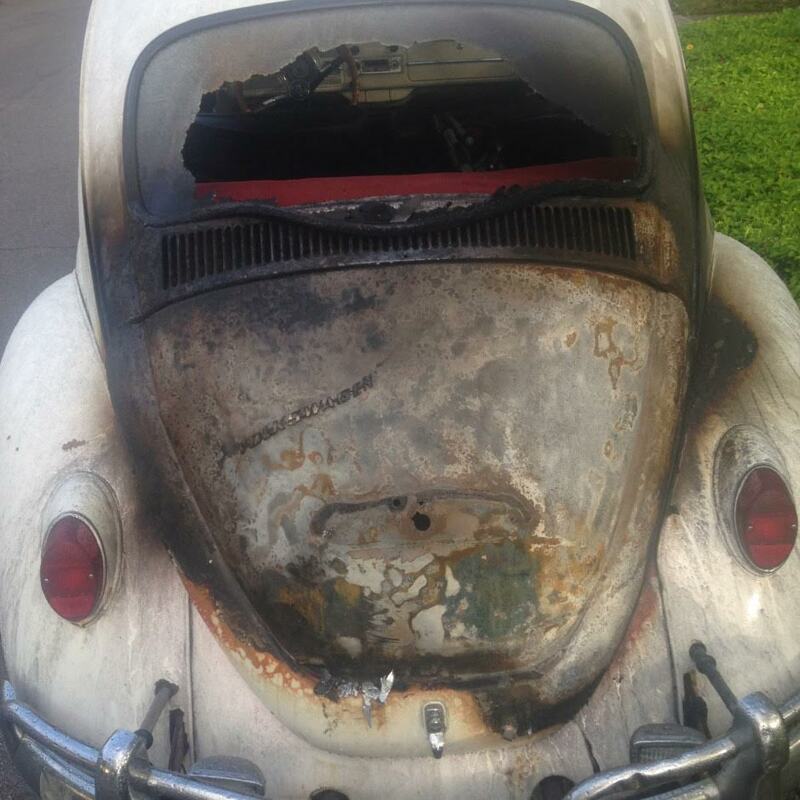 Having an engine fire on your Bug is horrible and the experience will make you pay very close attention from that point forward. So will just witnessing one. I remember when I was about 18 (driving a 1969 Karmann Ghia coupe), my friend had removed and replaced the carburetor on his late model Beetle to do some engine work. He called me and told me to stop by to go for a ride with him while he made final adjustments once he started the car. I agreed, and as I drove up to his house, all I could see was him beating out a large ball of fire in the engine compartment with his mom’s new front doormat!!! Seems he put everything back properly, but never connected the fuel line to to either the carburetor OR the fuel pump and gas simply pumped all over the distributor starting the fire. Luckily, because he got the fire out so quickly, only a few wires burned. They were easily repaired and a bit of car wax removed the soot from the inside of the engine cover. Since that day however, I am very sensitive to how easily things can end up burned up. Funny now (not at all then), but my friend’s embarrassment for making this kind of error was nothing compared to our laughter when his mom yelled at him for ruining her new front doormat!!! As soon as we got his car in order that evening, he bought her a new one…LOLOLO!!!!! Small world. The ’62 Beetle I was hired to look at a few weeks ago for good friend Chris Vallone was almost lost to a fire last night for the same reasons. We have to do all we can to keep these cars on the road and safe. Always great stuff from Jay. Another interesting and very necessary article. Thank you. Thank you. I have had several beetles over the years and recently bought a nice 63. I know I am in the wrong place, but I am learning a lot of information here. In the past, I never worried about an engine fire. I put on new German fuel lines and when replacing it, the carb inlet tube popped right out into my hand. I used safety wire from a fuel bowl bolt to the hose clamp on the wire. Then I ran safety wire from both hose clamps on the inline fuel filter. I also did the same thing on the fuel pump. The carb is sitting in my workbench as I type this and using the photos here, plan to “stake” it in place. I may safety wire it after just in case. Thank you again. Thank you. Not idea who or how I would get to install the screw in inlet, I am going with staking and using safety wire to make sure it stays in place. Thank you, but right now my biggest issue is getting the engine running right. I bought a used Solex 30 Pict -2 and rebuilt it down to the ball bearings. Trying to get the correct jets for the car and my altitude (4,500 feet). I am now rebuilding the Emphi that was on the car and cleaning out the small pieces of the fuel pump after it disintegrated while driving down the road and the trash was sucked into the carb. No fuel filter…yet. As much as I do not like Chinese parts, the car was running, not idling well, but running along at 60 m.p.h on the empi. Until the fuel pump went out, then things went south. I plan to use the empi as a bckup if the Solex does not work. I checked the throttle shaft and it does have a very small amount of movement, but nothing like the ones I have read about. The movement is about the same as the empi. I have my fingers crossed. Thank you for your advice. Jay I am wondering if the Solex Pict 30 -2 is to large for my beetle? The car is a 63, actually made in 62, with Wolfsburgs emblems, but along the way the engine has been replaced. I am not sure of the engine size and new tin was installed that left of the air outlets. The Solex main jet is marked 16.5. The empi has a 120 main with a 55 idle jet. I have no experience with carbs and rebuilding the Solex was my first one. I was putting it on the car and discovered two small cracks on the carb spacer for the alternator. Waiting for a new one to be delivered. 40hphil: It does not take much for that inlet tube to get loose it seems. I like he idea of “staking” the carb, but I am a bit paranoid that I might crack the carb body. I use safety wire. I attach it to the hose clamp and over to the other side of the carb. I try to not make it to ugly, but a fire is a lot uglier. That’s a good idea, David. The precaution which solves the problem is to have the threaded inlet tube installed into the carburetor. That’s what I have done and I feel much safer for it. It is an inexpensive installation which is not time-consuming.